Human disasters like the Japan earthquake tend to bring out the worst in people. If there is any fraud as old as humanity, it may be a scam of compassion. The crippled, the wounded, the widow hunched over in her black cloak in the middle of Rome's ancient wonders: are they really who they seem to be? Or, once they've taken your money, will they spring up and run off to buy a Big Mac or set up their next victim? Likely as not, it's the latter, and every time an enormous catastrophe like Friday's earthquake and tsunami in Japan comes around, the outpouring of human compassion can just as easily be swept up by fraud. Immediately after the earthquake that devastated Haiti, for instance, so many donation scams cropped up that the FBI issued an official warning against them. It's the usual warnings: don't respond to unsolicited emails. Don't click on links contained in emails from people you don't know. Don't give personal information to someone soliciting money, and always go through an organization -- and you should type the URL into your address bar yourself, if you're donating online -- not an individual.For nearly every disaster, the best charity to look to is the Red Cross. (And to be safe, you can type "redcross.org" into your address bar instead of clicking links, even from friends on Facebook or Twitter.) According to Charity Navigator, the Red Cross spends 91.8% of its receipts for "program expenses"; in other words, helping people. Searching a nonprofit comparison service like Charity Navigator is a great place to start. There you can assess how much of the organization's collections go to crisis relief or a cause you want to support, as well as learning some other interesting information -- how much the CEO or Executive Director is paid, for instance (the Red Cross's Gail McGovern makes $446,867, a reasonable amount for a CEO), and how much is spent to solicit funds. I'm always skeptical of organizations whose solicitation costs are high (more than 10% of total revenue, for example). 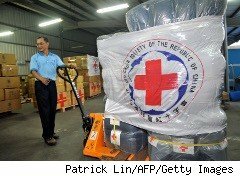 Often, we come across non-profits that are doing new or unusual things and providing relief in innovative ways; should we ignore these because they aren't the Red Cross? Perhaps not; but it's worthwhile to investigate further before giving. Search using a charity comparison service, or call the charity's main office to request a copy of its "Form 990," which all 501(c)(3) organizations are required to provide on request. Do your homework before forking over your cash; don't respond to phone calls or emails soliciting funds; and make sure your payment is being processed securely. If you can't find out much information about a company, but feel certain you're doing the right thing, at the very least protect your personal information by giving through Paypal or another respected, third-party merchant service like Amazon Payments or Google Payments. Give generously, but give carefully.